We owe the well-known Englishman’s to the appearance of a large number of wonderful things, including not only the deductive method of S. Holmes, apple pie, tea-drinking traditions, but also especially cozy, very harmonious and colorful English-style interiors. Among the wide variety of trends, this style is distinguished by its unique warmth, relaxed atmosphere, combining a commitment to tradition with maximum functionality and comfort for life.In fact, having experienced the character of the style and correctly using square meters, even the owner of a typical small-sized housing can reproduce a purely English atmosphere in his apartment. Let’s try together to recall the characteristics of the English style. In the materials used. The priority of natural raw materials: fine wood: ash, stained oak, yew, walnut, as well as leather, natural fabrics. Wood is used to finish the ceiling, floor, wall panels, make out the fireplace. In a clear delimitation of space for its intended purpose. Here the living room will be only a living room, and the kitchen will be the kitchen. English style does not involve combining / combining premises for different purposes. In such interiors, you will not find a screen or partitions. Rooms as densely furnished with furniture. In this case, the furnishings are located close enough to each other. In the obligatory presence of a large number of accessories and decor. The surfaces (dresser, table, mantelpiece, walls) are decorated with souvenirs, miniatures, landscapes, watercolors, engravings, candlesticks, family heirlooms. This trend is distinguished by good quality and aristocratic, lack of fakes and flashy luxury. In the use of geometric clear forms. In the elements of ancient architecture (borders, columns, arches). In a wide use of textiles: blankets, capes on upholstered furniture, curtains, cushions, tapestries, including accessories, created by yourself. Characteristic for this style of material is chins – thick cotton with a floral print. When making the walls is often used wallpaper from the fabric. This style of interior design is quite versatile, so it is ideal not only for private residences: spacious country cottages, townhouses. 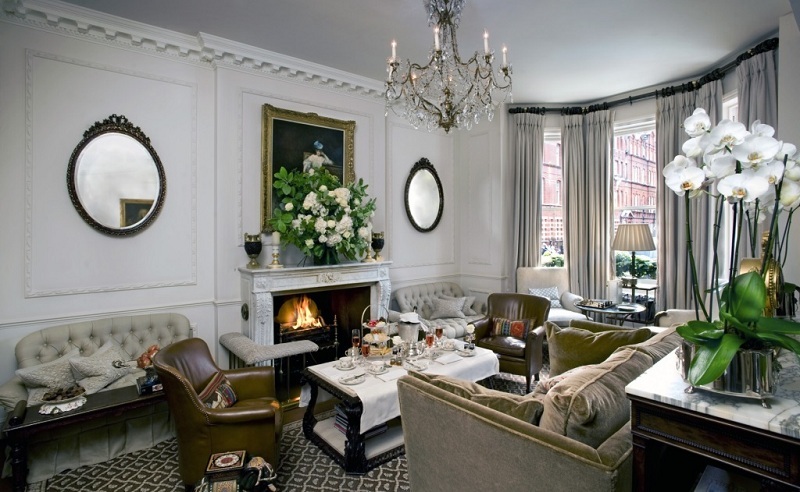 There is no reason to abandon the English style, choosing a design urban apartment type. 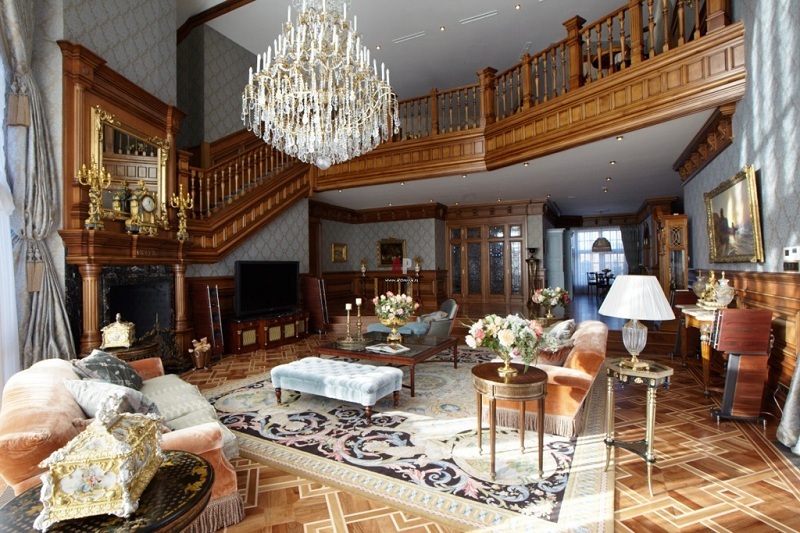 This trend is relevant to those who appreciate the understated elegance of classic interiors, and is popular with property owners who prefer austerity, harmony, and naturalness. Here it is important to maintain a balance. Painting the surface of the walls in bright, spectacular colors, choose the furnishing of neutral, calm colors and vice versa. Paint or wallpaper. They can be paper or textile, consisting of 2 layers. The basis of the latter is flizelin, and the front cover is a layer of jacquard. The main advantage of textile wallpaper is aestheticism of eco-friendly materials, embodied in the luxurious floral ornaments, classic monograms. In addition, they are characterized by good sound and heat insulating properties. For the English style in the interior of the apartment, you can choose monochrome in a large horizontal or vertical stripes or buy wallpaper with a floral print. The bottom of the wall is decorated with wide plinths. Finishing of vertical surfaces with wood panels. In most cases, such design is used for home office or library. Part of the surface (about 75-80 cm from the floor) is sheathed with wood panels, and the rest of the area is covered with wallpaper. The top is decorated with moldings / carved eaves. 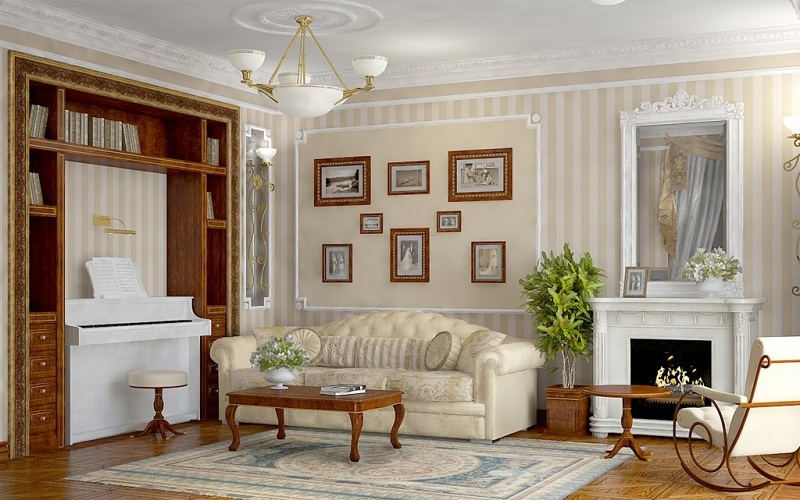 To recreate this style, ceilings are often decorated with stucco or smoothly plastered. Preference to light tones: cream, ivory, boiled white, light beige. Focus on stucco elements allows them to paint one or two tones brighter. An interesting solution – caisson ceilings. In this embodiment, the surface is sheathed with wood panels, which can have any geometric shape. 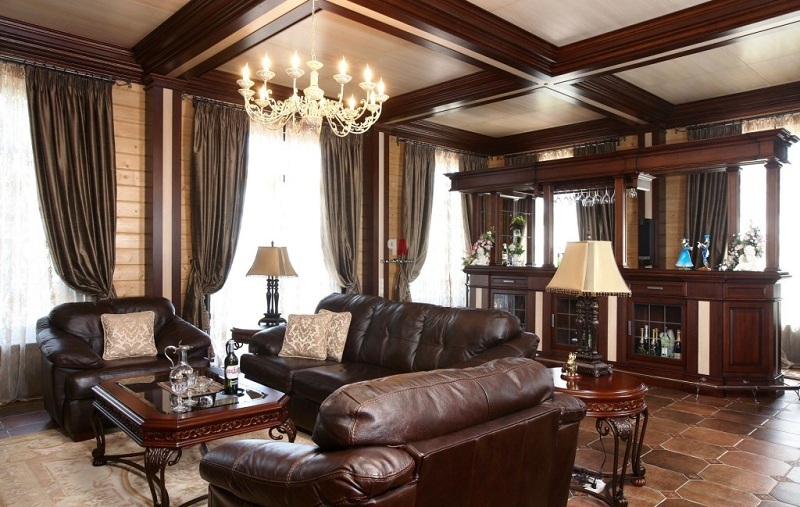 Of course, for standard apartments today rarely use wooden ceiling trim, wall panels. However, in this case, with the right approach, it is not difficult to “tie” all the elements into a single style decision. Depending on the purpose of the room, flooring or parquet floor made of valuable species is used as a floor covering. Most often the floors are covered with carpet. Carpets with an unobtrusive floral or geometric pattern of Oriental origin, reminiscent of the colonial past of England, emphasize respectability and low-key luxury of the living room. They will be the highlight of the interior and make it even more comfortable, natural, peaceful. For the kitchen, hall, bathroom fit ceramic tiles of warm colors and preferably unglazed. Floors can also be decorated with mosaic panels. Fireplace – the center of heat, the main place in the house. 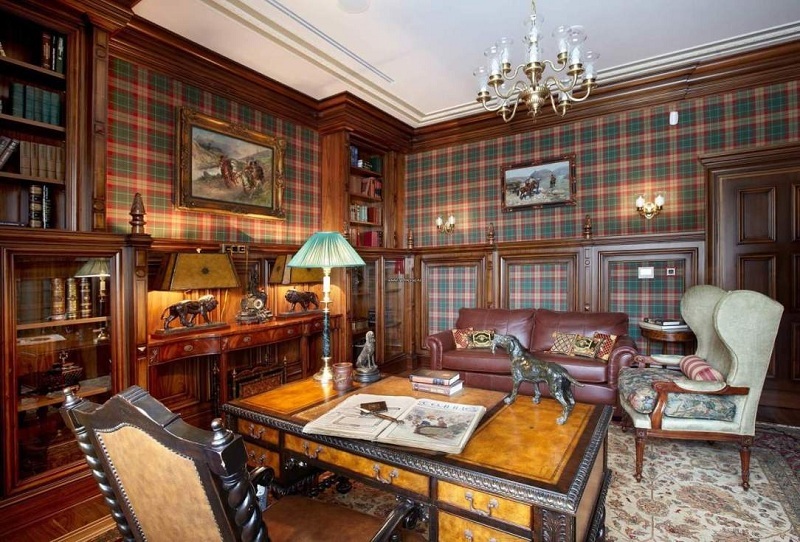 Without it, the English interior rarely costs. But if before the fireplace served as a purely utilitarian function (used for heating), at present it is mostly a decorative element. However, the fire still attracts and soothes, inspires and warms. Modern elegant devices “dressed” in steel and heat-resistant glass. They fill the room with a romantic aura, mysticism and become the center of attraction for the whole family. Manufacturers of electric fireplaces offer devices whose portal and columns are decorated with exquisite carvings and the flames in them are reproduced very realistically. In an English-style living room with a fireplace, I want to spend peaceful family evenings, wrapped in a fluffy blanket and watching the flames of the flame. The inhabitants of Foggy Albion love comfort, so they have a special relationship with their home environment. Interiors, as a rule, they are filled with high-quality furniture. 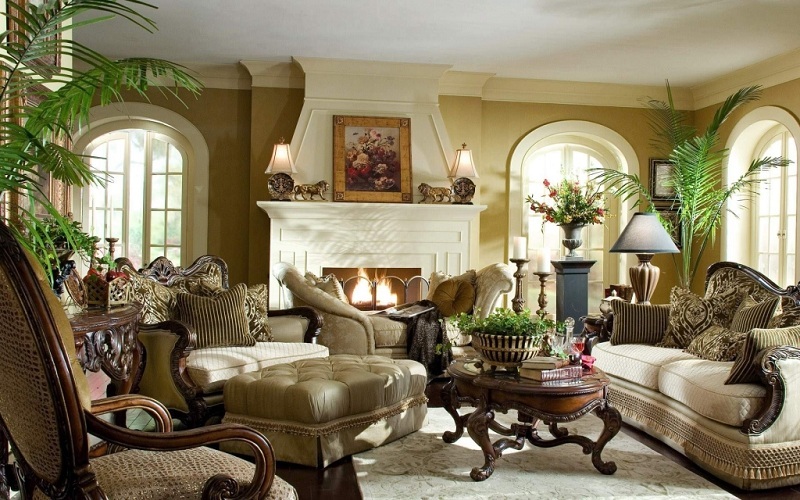 English style can be “calculated” by dining areas, armchairs, cabinets, pedestals, made of mahogany or stained oak. Obviously, this luxury is not available to the average man in the street, but expensive furniture can be successfully replaced with high-quality counterparts from MDF. It is important that the whole environment meets the key stylistic requirements. 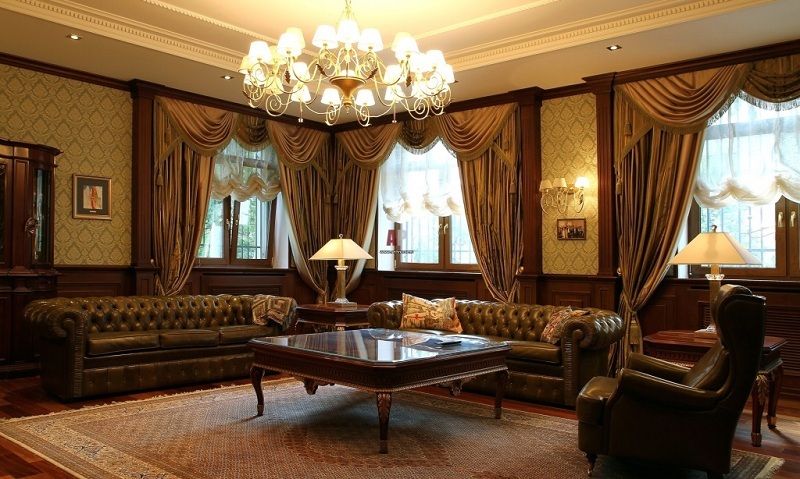 As for upholstered furniture, the main focus should be on the color and texture of the upholstery. Save money is not worth it, because the English style is a luxury and respectability. The priority is soft corners upholstered in velvet, leather, tapestry, jacquard. Developing design, experts will certainly remember the classic English chair, bookcases (shelves for literature), as well as the Chesterfield sofa, which is easily recognizable by the armrests, which form a single piece with the back and a diamond stitch. It came to us from the XVIII century, but today it looks fashionable and relevant. It can be made in a completely different interpretation: upholstered in soft velor or Eco-leather. Such a design is a godsend for lovers of stylish trifles: statuettes, vases, paintings. The interior looks perfect massive floor or wall clocks. Often, designers practice the “mirror” principle, making expensive paintings in monochromatic strict frames, and mirrors – gilded carved baguette. 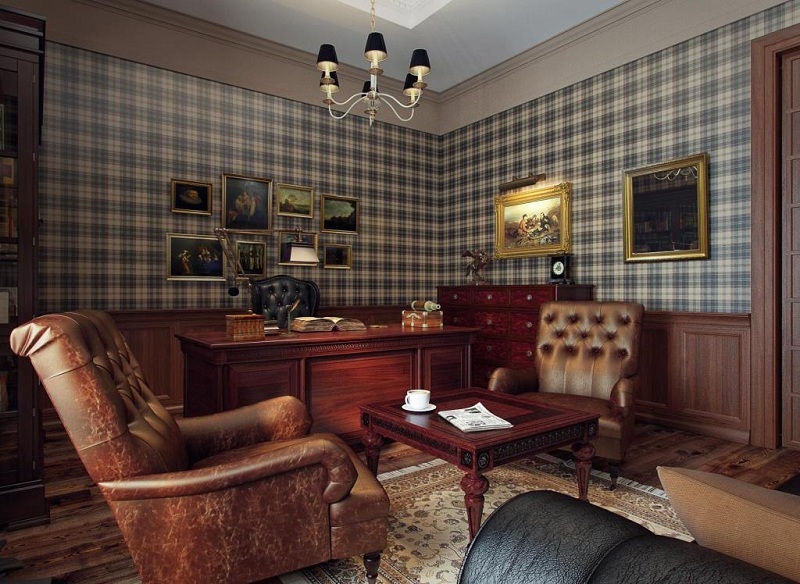 We are sure that the article and the photo helped our readers to get an idea of ​​the English style in the interior, in order to abandon stereotypes and create a harmonious, elegant and functional space in the apartment!